With 342 bridges in the grand city of St. Petersburg, it is almost impossible to move through the streets without crossing a bridge. When your visa free St. Petersburg Cruise docks, pay attention to which side of the Neva River you step down upon! According to a set schedule, thirteen of the more sizable bridges are raised nightly for a few hours to let large boats pass; there is no way for cars or pedestrians to travel across the water. Be sure to check the timetable! The Palace Bridge is one of the most famous bridges to vault over the Neva River. Dazzling pictures of this bridge grace the albums of every tourist who comes on our visa free St. Petersburg Cruise. The lion sculptures, elaborate railings, and pavilions are an iconic part of the cityscape. Set between Winter Palace and the historic landmarks of Vasilevsky Island, the height of the Palace Bridge was designed to ensure a clear view of the surrounding monuments. Over 30,000 cars traverse this bridge daily, and it is the site of massive traffic jams. Opened in 1903, the Art Nouveau style Trinity Bridge is elegant and opulent. It features curving cast-iron beams, sculptural streetlamps, and granite obelisks that support two-headed imperial eagles. The name of this bridge pays homage to the Trinity Cathedral, which once stood on the Petrograd side of the river. 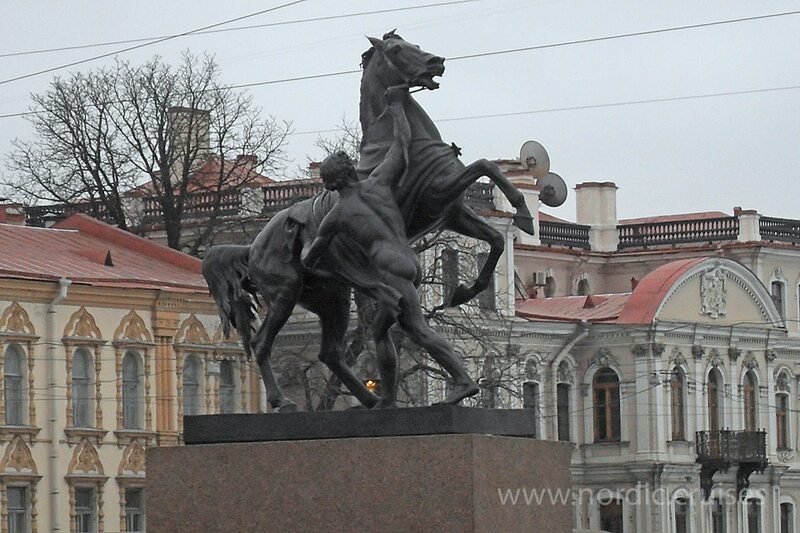 Built on Nevsky Prospekt, the Anichkov Bridge is best known for the bronze-cast Horse Tamers sculptures that crown all four corners of the structure. A close gaze at the railings will reveal fantastical decorations, such as seahorses and mermaids. 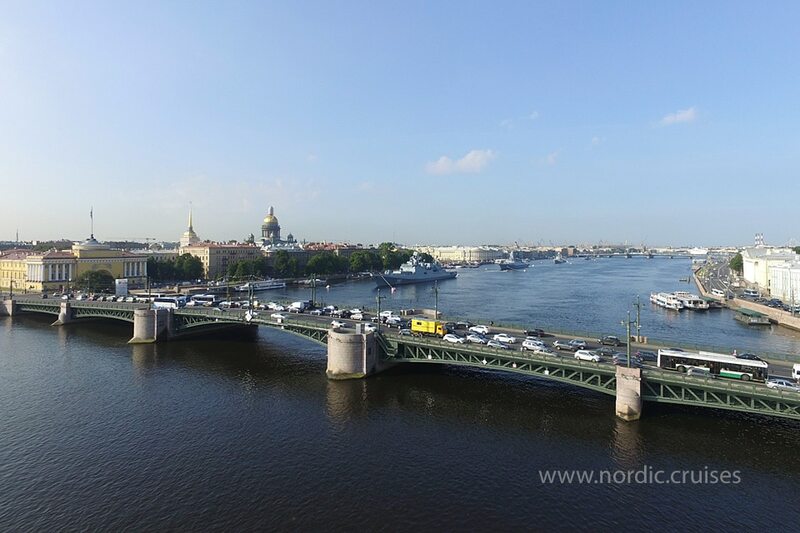 As you tour Nevsky Prospekt as a part of your visa free St. Petersburg cruise itinerary, it is worthwhile to detour about 300 meters south to view the Lomonosov Bridge, named after the accomplished Russian scholar. This bridge no longer opens for passing sea vessels, yet the delightful Doric pavilions that used to contain the drawbridge controls remain, creating its unique and distinctive silhouette. The Hermitage Bridge arches over water as the oldest and smallest stone bridge in St. Petersburg – in lovely contrast with the awesome architecture of the bridges already mentioned. Built originally as a wooden drawbridge, this charming structure was rebuilt in 1760 from limestone and brick with a granite façade. As a hallmark in the Hermitage and Winter Palace district, the quaint Hermitage Bridge is a popular focus in countless postcards of St. Petersburg. Take a moment during your visa free St. Petersburg cruise to appreciate the classic view of the Hermitage Bridge from nearby Millionnaya Street.